Inge Santoso - Learn and Grow! Are you Inge, the Photographer? This morning I received a call and she asked, "Are you Inge, the photographer?" Since I have never considered myself as a photographer, I said no, thinking she might have mistaken me for someone else. Then she asked again whether I was the one who often took photos at Vihara Dhamma Sundara. It was not a mistake, so I said yes. She asked whether I could take photos of her child's engagement party. I told her that I was not a professional photographer, so I declined. She was quite insistent. She said that I had good camera equipment and surely I could take a simple assignment like taking photos of engagement party at home. Once again, I felt that I was not good enough to be called a professional photographer, I declined for the second time. Somehow she believed that I could do the job and kept asking me, explaining that it was a simple engagement and she only needed 30-40 photos printed for the occasion. For the third time, I declined because I did not good enough editing skills for post-production. Finally, she took 'no' for an answer. After saying 'no', I could not get this incident out of my head. I wonder why I declined this opportunity. First, I feel that I am not good enough to be called a professional photographer. I have never been paid for my photos or services. Did I refuse because I was just too afraid? Did I refuse because I felt unworthy? Second, I have expectations regarding the role of professional photographers. A real professional photographer has the ability of editing in post-production and will produce good results. I have no editing skill other than cropping, adjusting brightness and contrast. Third, I consider whether this assignment is worth my time and effort. It may be an experience but I do want to be compensated for my effort. It is called professional service and not volunteering to help anymore. Last, if I want to be a professional photographer of my choice, I want to be a travel photographer. What do you think? Should I have said 'yes'? Last night our family had dinner at Ah Yat Abalone Seafood Restaurant, Rimba, Jimbaran Bali. We went back to our hotel, Movenpick Resort & Spa, Jimbaran by Blue Bird Taxi. Our taxi cost Rp 50,000, so I took out my wallet and gave the money to the driver. 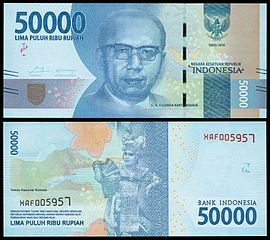 When I was walking away from the car, the driver called and he returned Rp 50,000 to me because I gave him two notes of Rp 50,000. I thanked him for his honesty. Then I had an idea and I gave the note back to him and wished him a happy new year! Honesty pays because he feels good and I feel good too. I am taking a 52-week saving challenge this year. I’ve seen many variations of this 52-week saving challenge on the web. I choose the random amount method and highlight the amount that I save that week. For example, last week I saved Rp 300,000 and this week Rp 400,000 then I highlighted the amount that I have saved. Until the end of the year, I would have saved Rp 13,780,000. I’ve put up the easy, medium and hard challenge if you want to do it as well. Get on track with your saving! Create your own saving challenge and share with us. Last Sunday I was enjoying a cup of hot mocha latte at Starbucks while watching the rain outside. I saw one guy sweeping the water away from the walkways and stairs. It seemed like a futile thing to do because the rain water kept on pouring down and when he got to the end, he had to come back and swept again. What would you have done in that situation? If this was your own house, you would probably have waited until the rain had stopped before began sweeping. Well, I would anyway. We often do not like doing something that seems futile and has no immediate or apparent results. For example, building a sizable amount of emergency fund. There seems to be countless emergencies popping up draining away our emergency fund, and we keep on trying to replace the depleted account. It may feel futile and sometime we just want to give up. When you want to give up, remember the lesson from the sweeper. He kept on sweeping because he wanted to minimize the risk of people falling down due to slippery walkways or stairs. It was not futile because it was about minimizing loss and risk. When we build our emergency fund, it is also for minimizing loss and risk. We reduce the risk of falling back into debt. It is not a futile thing to have a money cushion in the event of emergency or unexpected situations. If you are still struggling to build your emergency fund, don’t give up! You are on the right track and sooner or later you will get there. Press on! Yesterday I went to Starbucks to buy Starbucks’ 11th Anniversary mug. I had a voucher that entitled me for 30% discount. The price of the mug was quite expensive, Rp 75,000, and after discount it would be Rp 52,500. While I was there, I was offered to get Starbucks Reward Card with a minimum balance of Rp 100,000 and only for yesterday, I could get a free beverage (Mocha Cookie Crumble Frap tall size). I thought it was quite a good offer and I certainly could use the discount, so I agreed to get the Starbucks Reward Card for Rp 100,000. When they entered my purchase into the cash register, somehow the total amount came out to be Rp 130,000, instead of Rp 152,500. I told them that the amount did not seem right and they also agreed with me, but they had to follow the cash register. I ended up paying only Rp 130,000. I considered myself lucky when dealing with Starbucks because yesterday was the second time that I got something extra from Starbucks. Last time, I got an extra free drink because of another error. I put away Rp 22,500 into my lucky note stash to remind myself that sometimes I am just lucky! Do you have similar experience? If you do, please share in the comments. One of the reasons I have a credit card is free airport lounge access. A few years ago, gold card could get you a free airport lounge access. Nowadays you need to have at least a platinum card or higher (titanium, privilege, emerald or whatever they want to call it) to have a free access. If you have a gold card, then you may be able to use your reward points to get access. Is it really free? No! 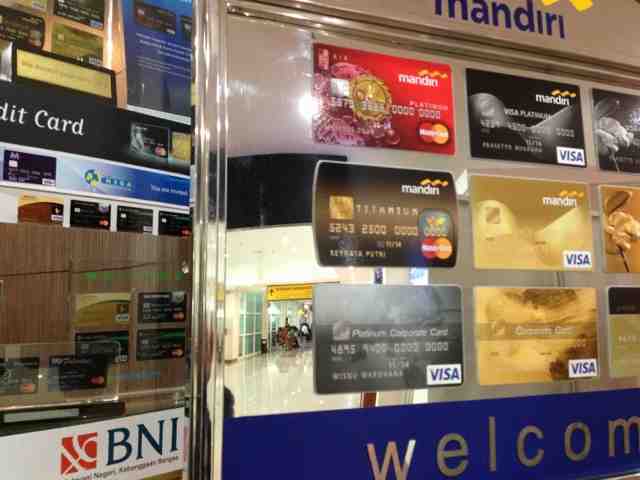 If you are paying a yearly fee for your platinum card at about Rp 600,000 to 750,000, then it is not really free. If you carry a balance on your credit card and you are paying interest, then it is definitely not free. You are actually giving subsidies to those people who pay their balance in full every month. If you are offered to apply for a new credit card just to get an airport lounge access, be smart! Ask yourself how often you are going to use the facility. If you travel less than 10 times a year, then you'd be better off just paying cash Rp 50,000 for one time access. If you only want some 'free' food available in the airport lounge, it is better to get a proper and more delicious food somewhere else. If you have a credit card that give you free access to airport lounge, then use it and enjoy yourself! If you have access for two, then get acquainted with someone new and use it to make friend. If you have a plan to travel overseas for more than a week, please remember to take care of your finances. If you know that you have bills due to be paid while you are overseas, you need to arrange the payments, either paying them online or delegating the task to someone that you can trust. If you have automated payments by debiting your account, then you do not need to worry about it. Just make sure that you check the amount when you get back from the trip. Please remember to pay your credit card bill because the late charge and interest are punishing. I know one bank charges Rp 150,000 just for late charge. Imagine if you are only using your credit card to buy one mocha latte at Starbucks for Rp 31,000 and you get to pay Rp 150,000 late charge – Aaaarrhhh! Pay your credit card bill early! This month, I paid all my credit card bills on the same day as when the e-statement arrived because I plan to go on a trip. I do not want to cut it too close because I will only come back one day before it is due. Better early than sorry! What about savings? I have an automated system to save and invest my money, so I am covered. Every month, my account will be debited and that money will go straight to saving and investment account. Automated savings makes life easier and you can have more time and freedom to do what you want. How about you? What do you usually do before going traveling? If you have some tips or comments, please share. What Can An Old Childhood Toy Teach Us? Yesterday while shifting stuff at family storage, I found this driving simulation toy from my childhood. I did not quite remember whether I got this for my 11th or 12th birthday, but I remembered the process before getting this toy. The toy was displayed in a toy store just opposite our old house. I regularly came to the toy store just to see what was new and interesting. When I saw it, I really wanted to have it. In the 80s, something like this was already a very technologically advance toy. The screen on the right displayed the road and when you turned the steering wheel, the car moved from left to right. I could not remember whether the speed changed by shifting the gear. Anyway I was quite obsessed in getting this particular toy. I told my parents that I wanted this toy for my birthday. They tried to persuade me not to buy it because it was quite expensive. I said I wanted it and I gave them several reasons why I wanted to get it. One of the reasons that I told them was that I could use it to practice my driving skill so I would be ready to drive by the time I reached the age of 17. When I think about it now, I realize how ridiculous the reasons and excuses that I gave to my parents. Yet they still bought me the toy. I played with it for about a week or so, and I just got bored with it. I did not think that I would lose interest that fast, but it happened. It went to the storage and I just found it again after more than 20 years. I showed it to my 3 year old nephew and he was not even interested in it, the iPad certainly had more appeal to him than something like this. Sometimes we are still like little kids. We want something so bad and we start making up reasons why we need it. We build a strong case about why we need and have to buy it now. Even the most ridiculous reason seems reasonable and acceptable. We can be so stubborn and do not want to hear other people’s advice or recommendation although they can see it more clearly than us. Sometimes they just keep quiet after a while because they can’t be bothered speaking to closed ears and mind. So if you still have friends who are honest with you about your silly purchases, be glad you have them around. Remember that the excitement often occurs during the wait, and we simply lose interest after we have it. Why not just keep waiting to keep the excitement going on and on? Hahahaha In a few months, we will be enchanted by different or newer toys anyway. At the moment, I am excited thinking about getting a MacBook Pro in December…I’ve been waiting for more than two years…perhaps I will buy, perhaps I will wait for the next and more advanced MacBook Pro. Have you ever been to an investment seminar? I like going to those free investment seminars and gatherings because I get to know many different products offered by various banks and financial institutions. If you are interested in learning more about financial products, you can come to these events with some cautions. Although it is often called a seminar, more often it is more about selling investment products. Even if it is a financial institution’s consumer gathering about economic outlook, at the end, we are often told about some new product offerings. Sometimes we get emotional when hearing the special offer available that day. For example, for the first 7 people who open an investment account with a minimum balance of Rp 100,000,000 will get a cashback of Rp 300,000. You can use the money to trade, but you are not allowed to withdraw for the first three months. We feel like we are getting some free easy money, but when you really calculate it, it is not really worth it. If you are loaded with lots of money, that amount may be a spare change for you and it does not matter where you put it. However if you are not, you need to think about the opportunity cost of putting that money there. You need to think whether there are better alternatives for you. What do you need to do if you come to these seminars? Come with a clear goal in mind – is it just to learn about an investment product? Then come to learn and do not buy anything. Ask a lot of questions. If you do not understand the product, do not invest in it. Get a second opinion from someone outside the seminar, preferably those with financial knowledge and unrelated to the financial institutions that are offering the products. If you have a trusted certified financial planner, you can ask him or her. Be skeptical, especially if they are offering something that is too good to be true because it often is. If they are saying that it is a no-risk, high return investment, then run away as fast as possible because nothing is without risk. The higher the return, the higher the risk. Do not get pressured by the account officers or sales people, especially if they say that if you do not take action now, you will miss out on the profit. Let it go! There will be other opportunities to make profit! Just like reading books, financial blogs, going to investment seminars can help you to be more knowledgeable about financial products. Use the opportunity to learn and may what you learn take you closer to your financial goals. How Much Interest Are You Getting from Your Bank? 0%? Do you know how much interest you are getting from your bank? In Indonesia, for most of the banks (BCA, Mandiri, and BNI) that I know of, if your balance in the saving account is less than Rp 1,000,000, you will earn 0% interest. If you have money less than Rp 1,000,000 sitting in the bank at the moment, you’d be better off by having the same amount under your bed. Why? Because not only you are not getting anything, but you are losing money through bank charges ranging from Rp 10,000 to Rp 12,000 per month. What should you do if your saving account’s balance is often under Rp 1,000,000? Get a saving account with no administration fee! There are several banks that offer free admin saving account – for example TabunganKu that has limited features such as a maximum of one or two withdrawals per month. Each bank has different terms and conditions for TabunganKu, so please go to the bank official site to get more information. Personally, I prefer Danamon Lebih when it comes to free admin bank account because not only there is no admin fee, but I can get cash back (max Rp 50,000 per month) from using the debit card when shopping. I also get an ATM card and internet banking facility. We need to be smart when it comes to our money. Try to get the best deal that suits our needs! A quick and easy way to calculate compound interest is using the rule of 72. In finance, the rule of 72 is used to estimate how many periods the investment will be doubled, given the interest percentage per period. If you can get a 12% interest or return on your investment per year, how many years will you double your money? If you invest Rp 10,000,000, when will it be Rp 20,000,000? So it will take approximately 6 years to double your money or make your investment become Rp 20,000,000. Let’s take another example. If you want to double your money in 3 years, what is the rate of return that you need? Remember to use this rule as an ESTIMATE because it is not meant to be exact. It is good for rough calculation that you can use without a financial calculator or spreadsheet. Compound interest is interest upon interest. That is, when an interest payment is added to the principal and then the whole thing (principal + interest) earns interest. Compound interest is what can make you rich when you invest. One of the most important elements in compound interest is time. The longer the time, the greater the impact. That’s why the best time to invest is yesterday! Since you cannot go back to yesterday, then the next best time is NOW! One day a father and his son went to play golf. Before they started the game, the father asked his son. 1. It’s OK to start small. The most important thing is to start NOW. 2. When you have more money, save and invest more! 3. You may not be able to get an interest of 100% like in the story, but there are financial instruments that can get you better return than bank saving rate. Inge Santoso, B. Com. Picture Window theme. Theme images by A330Pilot. Powered by Blogger.